Compass Rose is located at beautiful Sandy Point beach in Stockton Springs. Twenty minutes from Belfast, Forty minutes drive from Camden or Bangor, and an hour to Bar Harbor and Acadia National Park. This private three-bedroom waterfront property sleeps five and features a wraparound screened porch with expansive views of the Penobscot. The living room has a cathedral ceiling and french doors onto the porch. Once you arrive you may never want to leave, but this lovely cottage is within an easy drive of Several National and State Parks, and much more, so you can relax and explore to your hearts content. The master bedroom offers a comfortable queen bed—high enough to open your eyes each morning to the beautiful sunrise and beach. This bedroom abuts a bath with shower. The second bedroom with Queen bed also looks to the beach and shares a half bath with the third bedroom with a Full sized bed. The screened porch offers a large dining table for the entire family to gather, and many additional spots for quick meals and snacks throughout the day. In the evening, take in the soothing sights and sounds of the ocean while enjoying your freshly caught lobster feast—safe from the reach of pesky mosquitos. The smaller screened porch towards the back of the cottage offers views up the peninsula—where the sun goes down. No doubt you'll spend lots of time on the tranquil beach watching the sandpipers, loons and the occasional bald eagle cruise by. But, as night falls, you'll probably move inside to the covered porch for the evening meal and socializing. Day or night you'll be drawn to the bright and comfortably appointed living room featuring a cathedral ceiling and plenty of natural light—a perfect spot to curl up with a good book. You can't go wrong choosing a peaceful nook to relax in at Compass Rose Cottage—inside or out. The outside features privacy-fenced side yards, a movable hammock and well-equipped cooking grill. When you've had enough relaxation, local kayak rentals are available in Bucksport (7 miles), or you can take a walk around Fort Point State Park & Lighthouse. Privacy, serenity, and naturally beautiful surroundings are what make this Maine Cottage a true secret hideaway. The home is located directly on waterfront within steps to the beach. Linens & Bath Towels: 1 set of bed linens and 1 bath towel set for each guest included (beds are made up prior to guest arrival). Like clockwork as usual. Thanks for making it painless and easy. I think this was our 10th year at Compass Rose Cottage. We love the place and look forward to it every year. It is comfy and has all the comforts of home, plus the ocean/Penobscot Bay being a few steps from the front screened porch. The company was easy to work with, no issues. The house was small, quaint and comfortable. The proximity to the water made it such a relaxing week for me. The house was well stocked in every way. I loved the way all rooms opened into each other. So easy to work with. We will definitely us On the Water again and recommend you to friends. We loved the screen porch for our meals and just relaxing in the evening. We wanted a true Maine cottage and Compass Rose didnt disappoint. The location was very peaceful during the week, but the neighbors above were noisy on the weekends late at night. The agency is very easy to work with- check in for return customers was super easy!! Thank you for that! We love the cottage- everything about it! The interior and the way that it is decorated, the wrap-around porch and the close proximity to the water. The cottage was well-appointed; we had everything we needed. The master bedroom mattress was so comfortable- I haven't slept that well in a long time!! The folks at On the Water in Maine were very accommodating and easy to work with. All policies were very clearly spelled out. Love the location of this cottage. The outdoor fire pit area was very relaxing and was used as often as we were able to. Also loved the long front porch. The cottage had everything necessary for a comfortable stay. As a repeat customer, we're used to your modus operandi; it's like clockwork. Booking and getting the payments taken care of is easy and you send reminders only when necessary. We like that and you for it. Also like to get your occasional emails about other properties, mostly the "for sale" kind just to daydream. But Compass Rose will always remain our all time favorite. This is our ninth year at Compass Rose Cottage. Obviously, we love it there. We look forward to "our week" every year. It is a quintessential Maine cottage, white washed floors, walls, scatter rugs, comfy chairs and that wraparound screened porch overlooking our private beach can't be beat. All the modern comforts of home and lots of privacy. Great restaurants and places to poke around--- we love Belfast the most. But just enjoying the screened porch or relaxing on the beach is just fine, too. The folks at On the Water in Maine were very responsive leading up to our stay. The check-in/check-out system works very well. The cottage was beautiful. The owner was very thoughtful in providing everything we could possibly need to make our stay perfect. The view was spectacular. Our favorite part was the screened in porch. Beautiful, quintessential cottage with lovely view. We enjoyed the screened porch daily. Working with the company was smooth and efficient. Compass Rose was a lovely spot for a getaway. 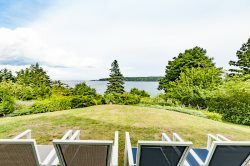 Clean, close to the Bay and centrally located for drives to Bar Harbor and Acadia. The cottage was as promised. I found everyone to be very pleasant and accommodating. The procedures for checking in and out were very simple and fast. Our vacation was excellent! The cottage was just what I was looking for in a place to stay right on the water. Very well stocked and nicely decorated! Loved all the different seating areas outside and in. The screen porch furniture was very comfortable as were the beds. Loved how bright and "beachy" all the rooms were decorated. This was our sixth year at Compass Rose Cottage (first under new ownership). We were very pleased with the changes made under new ownership - especially the new furnishings on the porch, the second bedroom and the many other new furnishings inside that only added to the quintessential seaside cottage feel. It is comfortable and homey. On the Water in Maine was a great company to book travel with! They made it very easy and kept us informed every step of the way. Awesome cottage! Loved the porch and the fireplace on the beach. We used the fireplace almost every night. Compass Rose is strategically located between Bangor, Rockland, and Acadia National Park. Everything we wanted to see was within an hours drive. Loved how calm this place was.